Join us for a horseback riding adventure in Indian Trail, NC. Looking for places to go horseback trail riding? Drop by Country Time Equestrian Events for the best horseback trail rides in the area. Located in Indian Trail, NC your horseback trail riding adventure awaits. Join us and experience the best guided horseback trail rides in a friendly, fun and wholesome environment. Bring your family, the kids and friends for a horseback trail riding adventure, have your next family reunion with us, or bring your co-workers for horseback rides and create memories that last a lifetime. Founded in 1989, we take great pride in providing enjoyable, memorable horseback trail riding adventures and delivering exceptional service. Our guides will saddle up a horse and take you for a fun and relaxing horseback ride around farm fields, country roads and scenic wooded trails. Private horseback trail rides are perfect for special or romantic occasions such as birthdays, anniversaries, and proposals. Join us for relaxing sunset horseback trail rides off the beaten path and an old-fashioned cowboy dinner around the bonfire. Children 12 years old and under can enjoy a safe, 30-minute arena ride on one of our child-friendly horses. Children pony parties are perfect way to celebrate a child's birthday and create memories they'll never forget. 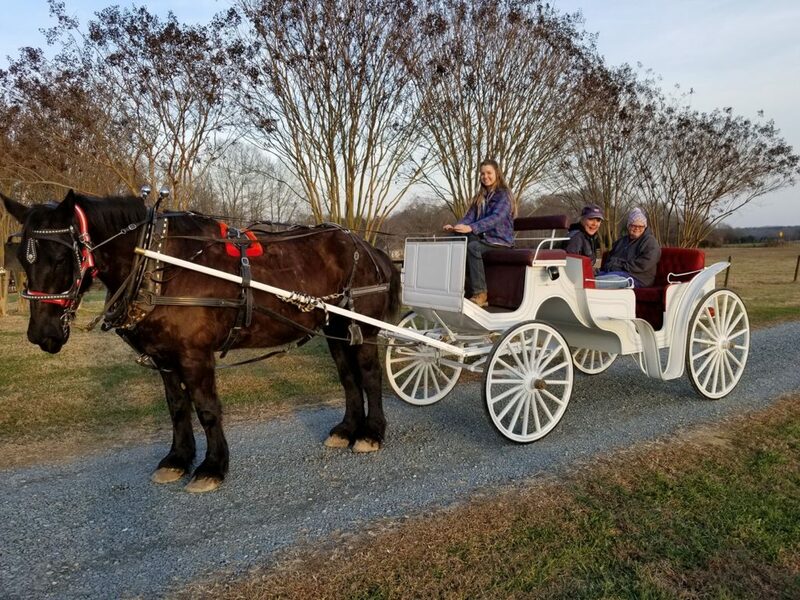 Take that special someone for a romantic carriage ride as you ask for their hand in marriage, or arrive in style for prom night. Good Company, Great Times & Good Fun! Ready for a horseback riding adventure? Join us for an adventure of Horseback Trail Rides and Good Family Fun. Located in Indian Trail, NC we're just a little ways down the road from Charlotte. So round up your posse and head on down, and get your Cowboy on for a day of horseback riding. Founded in 1989, our highly skilled and experienced staff "The Wranglers" take great pride in providing enjoyable, memorable horseback riding experiences that last a lifetime, and delivering exceptional service. Our staff have many years of experience in all areas of equine. Their skills sets and experience includes; horse training, riding and driving horses, horse breeding , boarding, riding lessons, and providing horseback riding events and adventures for public. Drop by and meet our friendly, and courteous staff of equine professionals. Ready to schedule your horseback riding adventure? Curious about horseback rides, or need to contact us? Let us know. We’d love to hear from you! Join us for memorable horseback riding and equestrian adventures.